If your lawn has seen better days, it may be time to replace it. While there is no hard and fast rule, generally if less than half of your grass is green and healthy, you may want to consider starting over by laying new sod. The best time to lay sod is when the weather is cooler, but the grass is still growing. 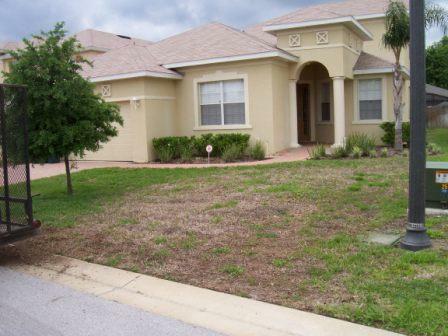 For us Floridians, this means the ideal time for sod replacement is during spring time. You’ll need to choose the right type of sod based on the type of soil you have and the climate where you live. Once you have picked your new grass, you’ll need to prepare its new home to be as welcoming as possible. Begin by removing the old sod along with any weeds, rocks, and other debris. Add new soil and grade it. This is the ideal time to fill in any low spots with soil from any high spots. You can also take care of any drainage issues you may have had and make sure water will be flowing away from your home, driveway, or other structures. Remember to keep the level of the soil lower than sidewalks, walkways, or other landscaping features so once the new sod is laid down, it will be flush with them. Now is also the time to add amendments to the soil. Adding lime or sulfur can adjust the pH of your soil, if needed. Mixing in organic compost or manure will provide your new sod with nutrients and help it retain water. With the soil prepared, lay down the new sod in straight rows, and stagger the pieces to make a brick pattern in the grass. Make sure the pieces of sod are pushed closely against each other and press them down so they are seated firmly on the soil. You can use a knife to cut the sod around landscaping features or sprinkler heads if you have them. Once the new sod is down, it needs to be watered to encourage the roots to grow down into the new soil. Two to three shorter watering over the course of the day will work better than one long soaking. While laying new sod can be a Do-It-Yourself project, it can also be labor intensive and time consuming. Consider contacting the professionals at Ludlow's to see how their knowledge and experience can take care of your sod replacement during spring time and keep your lawn looking full and beautiful.